The links in this post are referral links and MamaBreak may receive credit for their use. For those that know Citrus Lane, you know that this week is SHIP WEEK!!! 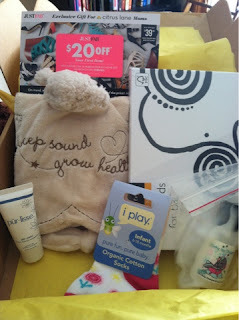 We are so excited to get this month's box! The Citrus Lane folks said it would be something "eco-friendly" and would include a company a lot of people ask for! How exciting! In honor of ship week, we are giving away 2--- yes TWO-- subscriptions to Citrus Lane. 2 winners will win a 3-month subscription to Citrus Lane where you get to choose your age AND gender to personalize your box! Want to read our last review? You can find it HERE. You do not want to miss this fantastic giveaway! This giveaway is in no way sponsored by Citrus Lane. MamaBreak is responsible for the shipping of the prize for the giveaway. Our family is loving gardening right now. The boys get nice and dirty and try to participate in all of the garden tasks, and the parents like seeing the landscape change before our eyes. We've just planted a whole bunch of seeds together. going for walks and to the park. going to playgrounds with my little guy! I love going on picnics at the park! We just bought our 3 year old his first real soccer ball and we've been having fun kicking it around as a family! I love shopping at farmer's markets. Playing outside with my children. In the Spring I love to start eating meals outside.... unfortunately it hasn't warmed up enough to do that this year. Just being able to take the kids somewhere without all the bulk! MN gets cold in the Winter. A nice easy trip to the library with no coats is AMAZING! Oh we love taking walks to the park! I love taking my dog to the dog park! I love running in the nice warm air! My favorite springtime activity is bike riding with my husband and daughter. I like going on walks again. I love to walk outside with my kids! I enjoy walking in the park with my family the most during spring. Sitting outside with a good book! Getting out after being inside all winter - back yard, park, shopping, whatever! Especially eating on the screened porch. Before babies, it was kayaking....now I just like spending time outside with the twins! I enjoy gardening a lot! Getting outdoors with my kids. Gardening hands down. I love preparing for that full bloom summer garden. I enjoy planting flowers and being outside with our dogs and having a cookout. I love to play outside with my boys! Thanks! I enjoy working in the yard, walks in the park, walking my dog, but most importantly spending time with the hubby outside. I love digging in the garden! Since we moved into our new home this past fall, this spring I'm looking forward to redoing some of our landscaping! Gardening of coarse, or just being outside in general. Going to swimming pool and park with my little one. Swimming and taking my little guy out on his trike :) Thanks for the giveaway! Just getting outside and taking a walk. walking to the park, putting in our garden and being able to have my coffee outside! Just sitting outside on the porch drinking a cup of coffee enjoying the weather. I like to go for walks too when it's nice outside. I enjoy setting up my garden and planting tomatoes! Running! (: And sometimes, spring cleaning! We've finally been able to get our lo out in her stroller for the first time (born late October in Wisconsin), and she loves it! I enjoy planting flowers in the flower bed the most. My favorite activity for spring is going to the park and have a picnic with my son and look at the flowers! I love being able to open up the house and let the sunshine in! To go to the park and have a picnic lunch with family. Gardening and getting fresh air! Going for walks! I love the crisp and clean weather! We love getting out after a long winter. Playgrounds and parks, runs and bike rides. We enjoy hiking and taking the kids on nature walks! They love picking fresh berries! We love being outside - picnics, playing on the playset, riding bikes, and hanging out on the hammock! Farmer markets and theres this thing in Portland that's called the Saturday Market and its like a big outdoor craft market. It's me twin's first spring. I love getting to show them all the flowers that are starting to bloom! Going for walks with my kids. Going to the lake with my boys! I want to win! This is a huge extra expense for our family right now. My daughter gets so excited to get her CL box every month, probably will have to cancel for the summer- since I'm out a job during the summertime. Crossing my fingers!! I love being able to take my dog for a walk. Thanks for the giveaway and wonderful reviews! I love using my new jogging stroller, can't wait for more great weather this summer! Playtime at the park! And long walks with the baby in the stroller and the dog by my side! I enjoy playing outside with my little ones. Just got our first CL box and we loved it. I would love to win a 3 month subscription. Thanks!! In the spring I love having picnics with my family!! Playing outside with the kids! Going on "Day Trips"...especially to Nature Sanctuaries...with my sweet hubby! Taking walks with my family. We love going to the park! My son loves all the new friends he meets and just loves to run around the grass in the sun. My daughter has only been walking for a few months now and she also loves to get outside and walk on the different surfaces(I.e Grass, Rock, Sand and playground rubber). I enjoy going for walks in our local nature preserve, and really, I LOVE having windows open in the house. I love taking walks outside in the spring! being in the fresh air! I love going to the Duck Pond and feeding the ducks and just enjoying the weather. Being outside in the sun.